We suspect the architects behind “the Tulip” are giving a nod to the famous European Tulip Mania of 1637. Even if the building is never completed, there may be no more fitting end to such a long trend toward positive social mood in the U.K.
A new building proposal could provide a fitting epilogue for London’s role in the financial markets. Socionomists recognize a link between grand infrastructure projects and financial markets. Such projects have historically tended to happen after a long positive social mood trend, as reflected by rising stock market indexes. The Empire State Building in New York is the iconic example. Built during the Great Depression but planned at the top of the “roaring 20s,” it serves as a monument to blind optimism. On Monday, plans were submitted for the construction of a 305-meter-tall tower shaped like a giant tulip in the heart of the City of London. The building will serve as a visitor attraction with the “bulb” of the tulip at the top acting as viewing areas. It will become the tallest building in the historic City of London, though it will be two meters shorter than the Shard skyscraper on the other side of the river Thames. The Shard is the tallest building in the U.K. (as well as the European Union) and was completed in 2012, the same year the London Olympics took place. Host cities of Olympics have a history of decline after years of buildup. 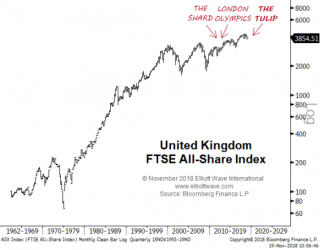 Six years have passed since those events, and in that time, the U.K. All-Share index has significantly underperformed the rest of the world. London’s reputation as a financial center is now under threat as Britain leaves the European Union.